The Model 276B3 is a ring-type 3-phase transformer for currents from 50-1200 amps. 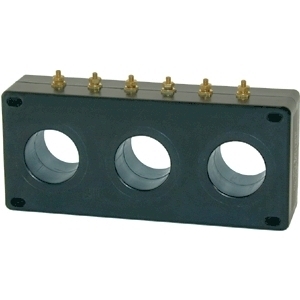 Secondary terminals are #8-32, brass studs with one flatwasher, lockwasher and regular nut. Polarity markings are stamped on the transformer. Holes at the corners of the transformer case are for attaching a mounting plate (not supplied).